RF showing a clear demarcation in hoof angle. In fact, medio-lateral balance seemed to be what was causing the most problems for Bob in shoes. Because we were more restricted with him in the amount of work we could do, his hooves have grown more slowly than normal - it will be 6-8 months before he has grown a full hoof capsule out of shoes. Bobby going home to continue growing a healthier hoof! He is sounder than he was on arrival, but it will be several more months before he has grown a complete hoof capsule. Unlike the majority of the rehab horses we see, Bobby had severe navicular bone damage apparent on X-ray. Bone can and does remodel once loading of the hoof and landing has improved, but it takes time. It takes many months of soft tissue damage to trigger navicular bone remodelling - the bone damage is the last thing to happen and will logically be the last thing to repair. Two nice mares, of completely different types - Bailey in the top photo, fit, lean and generally tricky to keep weight on. Lady in the lower photo, a typical "good doer" who lives on fresh air and is tricky to keep weight OFF! Both of them have nice feet - Lady's are still a work in progress as she hasn't been out of shoes long, but they are working very well for her at the moment. I've heard comments from a couple of vets recently which have reminded me how many false assumptions there are out there about hooves. Both vets were talking about laminitic horses and one stated that a particular horse "wasn't the type" to get laminitis, because it was too big and too lean - a bit like Bailey perhaps. Now of course there is huge difference between a bout of laminitis and the "footiness" that we often see at this time of year in a horse which is sensitive to grass. Nevertheless, they are two different ends of the same scale, and even mild sole sensitivity is a warning that the hoof is under attack. Of course (again!) horses and ponies which are overweight are at greater risk, and we should be making every effort not to let them pile on the pounds but we musn't let the visible appearance of a horse blind us to the fact that some horses are extremely sensitive to grass, whether they are fat or thin. So, of the two horses in the photos, it is, as you've guessed, Bailey who is sensitive to grass and cannot be allowed access to it at this time of year without it making her footy. Yet if you were to show Bailey to those vets, what would they advise to prevent her footiness? No prizes for guessing, and perhaps they wouldn't even recognise that there was damage being done to her hooves already from the grass. When horses come here for rehab, inevitably other therapeutic options have been tried first. Some have had shockwave treatment, some have had IRAP, some have had drug treatments and nearly all have had some form of remedial farriery. They come here because none of those have worked - they may be successful for other horses, but they haven't worked on these horses. Occasionally, in a last-ditch attempt to keep the horse in some form of gainful employment, the vet has suggested that the horse be worked on bute. There is a logic to this, if you view navicular or DDFT or collateral ligament damage as a degenerative condition that will get progressively worse no matter what - in that case, working a horse on bute allows it to carry on a bit longer and since the inevitable deterioration is unavoidable, there is no real downside. The problem though is that the pattern of improvement we see here suggests that its more like a repetitive strain injury - so if a horse is landing toe first or has a medio-lateral imbalance, then the longer that goes on the greater the damage will be. Once a horse is landing heel first on a balanced foot the strain is reduced and over time damage can start to repair. In this scenario, working a horse on bute can actually increase the damage - allowing a toe-first, imbalanced landing to continue without the guarding effect of pain will result in greater strain and greater damage. Its certainly the case that the horses which come here having been worked on bute take considerably longer to recover than those where the owners have refused to work a horse that "isn't right". Working these sorts of horse on bute isn't the end of the world, but its something that should be very carefully weighed up, particularly when the horse has compromised biomechanics. Horse and Hound verifies barefoot hunting mileage! This week's H&H has an article about how much mileage a foxhound covers in a typical day - the reporter was out with us on Exmoor for our last but one day of the season. There was a GPS on one of the hounds, and she and I were also riding with GPS. In fact, she left just before the end so the mileage of our horses (Felix, Angel and Bailey) was slightly more than hers (recorded at 21.69), but still its nice to have your mileage verified. The top speed she recorded on her mare was also fairly low - 19.9mph, which is about right for Angel, whereas Felix and Charlie regularly hit 27-28mph. There are some lovely photos in the current article though, including a long shot on p 68 where you can see Bailey second from last, Felix as the 4th horse and Angel as the 6th - a reminder of a fun day! Its interesting because it shows that its not just shod horses who can have problems due to a toe first landing. I'll be posting updates on Storm's progress over the next few weeks, I hope. ...with a new horse arriving, Lady's family up to visit her on Sunday and the continuing fencing saga. The fencing is now finished, and Andy has also built his dream - a (potential) water jump (potential because the stream is drying up rapidly in this weather so it will be a while before it fills up...). The new horse, Storm, is settling in well - slightly astonished at the number of horses here, and intrigued by Bailey and Lady, who are both in season and unintentionally causing quite a stir amongst the boys. However Ghost is unfazed and is fulfilling his usual role of nanny and mentor! 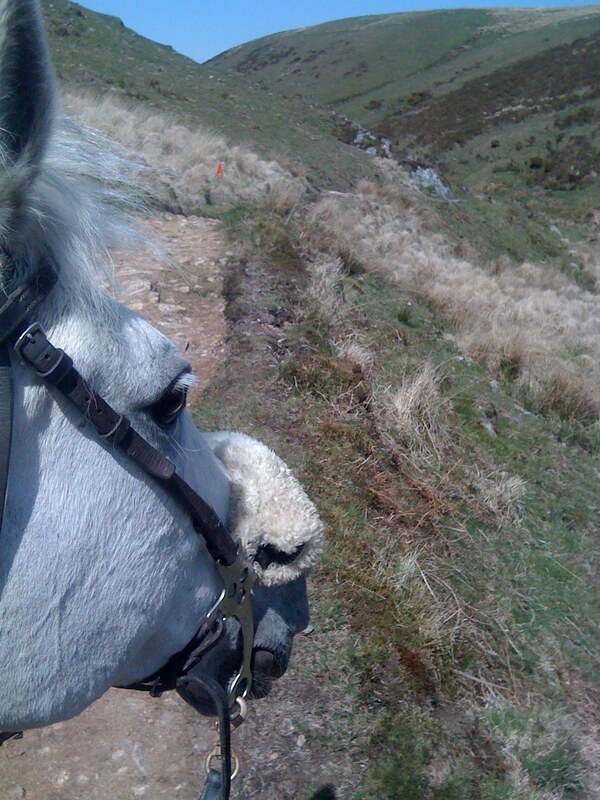 Lady has had a great weekend, with her family riding on Sunday (they took it in turns!). It could hardly have been a more perfect day, with wonderful weather and Lady going beautifully, and much better than they had expected - we all finished the day hot but happy. Jacko has a tedious habit of cribbing the top rail off, so we've now timber-locked them rather than nailing on - he doesn't know this yet...though he can still crib on them of course! 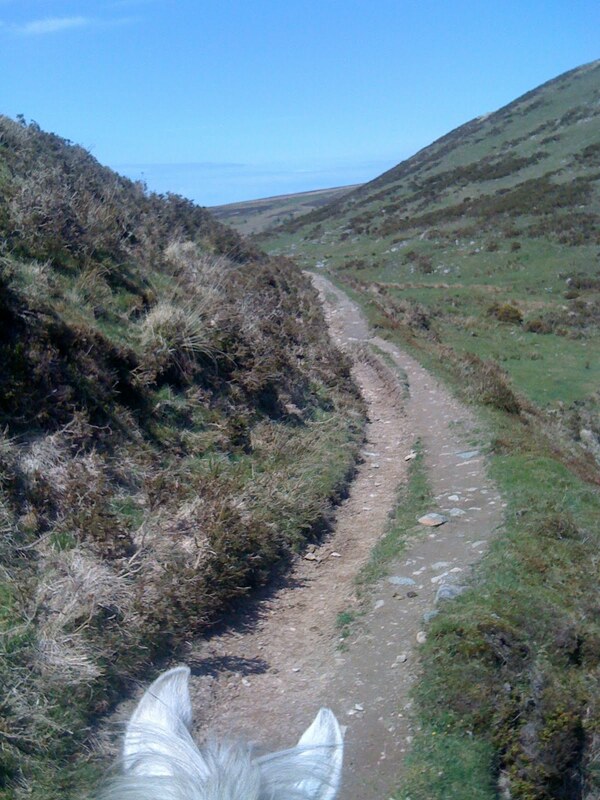 Exmoor -not such easy terrain as some people think! Ghost and I missed doing the Golden Horseshoe pleasure ride on Sunday, but seized the chance to roam around some of the main route "out of hours". Its also of course the area that we cover out hunting, and it was amazing how different some of the valleys look now, compared to a few weeks ago when they still seemed in the grip of winter. Grass - facts and fantasies! Grass is something that is causing much soul-searching, angst and stress amongst horse owners at this time of year, and particularly amongst owners who keep their horses barefoot. There seem to be pages and pages being written online at the moment, and if you have a quick scamper about on some of the forums you can find anything from statements that grass is the perfect all natural food for horses to statements that its tantamount to poison...! The entertaining thing is that when I was first interested in barefoot, 7 or 8 years ago, barefoot horses were all kept out 24/7 - partly no doubt because it was at the time when barefoot was synonymous with Strasser trimming, and part of her mantra was for horses to live out, unrugged and on grass all year round. Now, the pendulum has swung the other way, and some people think barefoot horses must never get even a sniff of grass - of course thats true for some horses, but not for others. Not true - horses are browser as well as grazers, and from an evolutionary perspective have evolved to eat a wide variety of plants. Grasses are part of the picture, but horses need more than a few species of grass in order to get the variety they need. Not true. It depends on the horse and it depends on the grazing. It IS true that many horses will go footy when sugar levels in grass rise - and they are highest during the day in Spring and summer. As a result, many barefoot horses (but not all) have healthier hooves if they are turned out at night rather than during the day. Equally, some fields are safer than others. Highly fertilised rye-grass in a warm, lowland area is probably the most dangerous - very few horses will tolerate grazing on this without developing hoof problems. Old, upland pasture with a wide variety of plants and a good mineral balance is probably the safest. We are very fortunate at Rockley that all our grazing is the latter, and so most horses can go out here at night even at this time of year. Not true. When you see a shod hoof with ripples, flare or a stretched white line (which is very many shod hooves) then you are seeing a horse with dietary problems, more often than not. The problem with shoeing is that it makes it much more difficult to spot slight deteriorations in performance - like a previously rock-crunching horse becoming footy. In a shod horse, its much easier for footiness to develop into full-blown laminitis simply because the warning signs are not as easy to read. Not bad for a 25 yr old veteran, particularly since he was diagnosed with navicular at 17 or 18...! I was going through some of the paperwork on Project Dexter yesterday and came across Dexter's veterinary report from Liphook Equine Hospital, following radiographs and an MRI scan, from a couple of years ago. "The horse has a long toe, thin sole conformation in both fore feet...Physical and radiographic examination indicate that this horse has poor foot conformation which is probably, in part, contributing to his ongoing lameness". I know that a lot of people are convinced that thoroughbreds have genetically bad feet - maybe they do. A lot of people are also convinced that feet can't change - or at least not much. Unlike many of the horses who come here, she had healthy frogs and a good digital cushion but despite this, she came with persistent lameness which on MRI was isolated to damage to the deep digital flexor tendon. Her right front was the worse foot, which is unusual, but following nerve-blocks it became apparent that the problem was in fact bilateral. She has only been here a short time, but the photos are intriguing because they give a clue to why shoes may have been exacerbating, not solving, her problems. Of course, its hard to take photos which are exactly comparable, and these aren't, but even so the shod foot is longer, and loading further forward, than the same hoof without a shoe. I had a lovely text from Kelly, Dexter's owner, at the weekend. Dexter is a lovely chestnut TB, who together with Kelly and his vet, Jeremy Hyde, was the inspiration for Project Dexter, our current research into navicular syndrome. 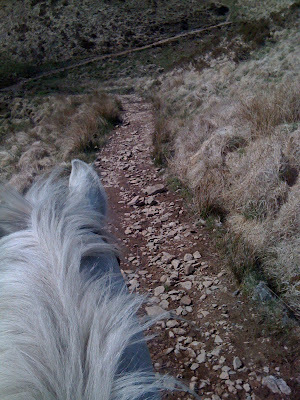 "Just had the most amazing ride round Winkleigh [a local BE XC course] on Dexter. He has never felt so good! Massive improvements even from last year and he took every jump in his stride and even jumped a really high part of a log when I was going to guide him to the easier side! He was unbelievable!" Its huge credit to Kelly that, when so many people are struggling with problems due to the late Spring and very rich grass, she has kept Dexter on top form. It does get easier with time and experience, but its still no mean achievement! Only problem is, Felix and I have agreed to do a pairs class with Kelly and Dex at our hunter trial in June - will we be able to keep up?!?! I posted updated footage of Lexus, and how he had improved his landing, here: http://rockleyfarm.blogspot.com/2010/04/lexus-update.html and it was clear then that he was already beginning to land heel first. A couple of weeks later, and these photos chart the progress of his hooves. Lexus is 19, but he he is changing his hooves just as quickly and just as radically as any of the younger rehab horses. If anyone ever thinks that its not worth considering barefoot for an older horse, these pictures should make them think again. He was telling me about his normal run circuit, and the fact that without thinking about it, he matches stride length to surfaces. So for instance running on a hard downhill slope he will subconsciously shorten his stride, protecting his joints from concussion. On an uphill slope he will extend, as concussion is naturally reduced uphill. These variations in stride, he was very vehement in stating, are nothing to do with his feet - in the sense that they are not adaptations because of sore feet - its all about joints and soft tissue. If you have good proprioception, then as you cover the ground you receive neural feedback about it - whether it is uneven, concussive, deep - and you adapt accordingly. Shoes reduce proprioception dramatically, and its only when you run barefoot or (very nearly, as in Andy's case!) that you get this feedback. Ironically, in expensive trainers, research (which we quoted in "Feet First") shows that although proprioception is reduced, concussion isn't - so the result is that your joints suffer more shock, not less because you fail to reduce stride length on harder surfaces. This brings me of course back to horses. Frankie is a good example - he is a TB with a weak digital cushion and therefore a poor ability to shock absorb. He works nicely on roads at the moment, and trots out perfectly level and tracking up, but his trot stride lengthens slightly if you trot him on grass. If you were to shoe him again tomorrow, he wouldn't be able to shock absorb any better BUT if you trotted him on tarmac he might well have a longer stride (given his past history he might also go stonkingly unlevel again, but lets leave that aside for now!). Now, a longer stride and a faster speed add up to even more concussion, and yet many people would automatically assume that a longer stride=comfortable horse=a good thing. They often also assume that a shorter stride=sore feet. However Andy's experience is that neither of these assumptions are true. I suspect that for many horses, a shod foot+weak digital cushion=reduced proprioception=longer stride=more concussion. Perhaps we should be a lot more analytical when we judge stride length and factor in proprioception and concussion before we judge whether its a good thing or not. More comings and going at the weekend, with Big Charlie setting off for home. He was a real gentle giant, and it was sad to see him go. Its also always a bit nerve-wracking when a horse goes home, both for me and for the owners, as we all keep everything crossed that the horse carries on doing well once back into his home routine and onto home grazing, which is nearly always richer than we have here(!). Fortunately Gemma is able to keep Charlie in during the day and will be working him hard, which is a recipe for success, and I am hoping for good updates about his progress over the next few weeks - I will let you know! Meanwhile the new girl, Lady has settled in well, although the fact that she was in raging season when she arrived, and had previously been kept with other mares, meant that all the unaccustomed male attention rather went to her head...However, she has very good manners and rather nice hooves, and so its been fairly easy to get straight into work with her. I will post photos of her hooves in the next day or so. 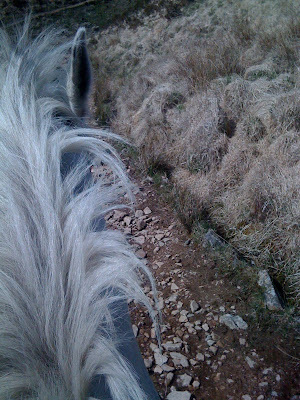 Studs and slipping - another eventing experience! There is a very interesting post on the UKNHCP forum here: http://uknhcp.myfastforum.org/sutra16599.php#16599 from one of our practitioners. It reinforces my own suspicions about studs, and echoes the experience of a (shod) eventer, who told me about the time she thought she had studs in, but in fact whoever should have been putting them in forgot, and she sailed round stud-less with perfect grip. She admitted she thinks there is a placebo effect with them as well.